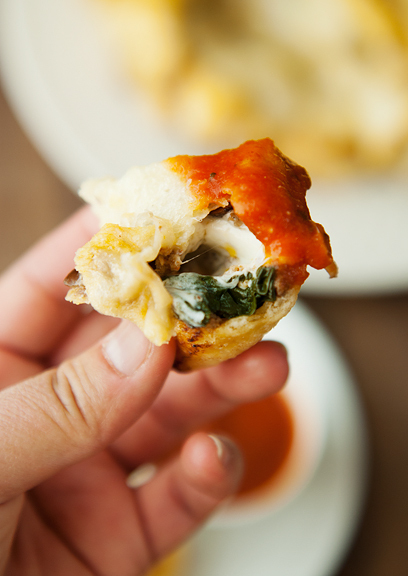 I found a recipe for pizza bites that originally came from my friend, Annie, and decided to keep the pizza theme, but alter the ingredients a tad. I wanted vegetables like spinach and mushrooms and figured it would be great with some Italian sausage. Obviously, you could make this vegetarian by giving the sausage the boot. What’s great is that much of this can be prepped ahead of time, like the filling. And I am still in love with this olive oil pizza dough from Zoe’s book. We make a bucket of it and have dough at the ready all the time. For this recipe, I weighed out two pounds of dough. To get 48 balls of dough, they need to weigh 2/3 ounce each. This is why a kitchen scale is so handy. If you don’t have one, I urge you to get one and make your life that much easier. Because I’m OCD, I had to make sure each and every ball of dough was completely sealed, spherical, and without holes. You know, each little ball has its boundaries and all. I didn’t want anyone gettin’ all up in someone else’s business. 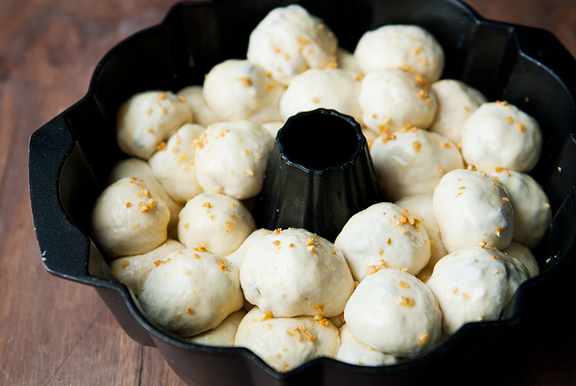 Once you have sealed a dough ball, brush it with the garlic butter and place it in the bundt pan. I know it seems obvious, but I’m just going to say it anyway – distribute the balls in the pan evenly. Some of the balls (which become amorphous blobs, but delicious amorphous blobs!) 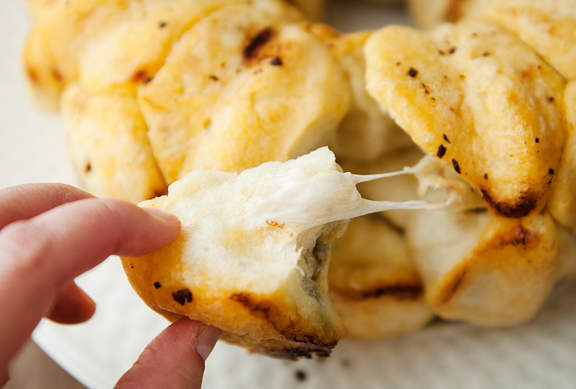 will spring leaks and ooze cheese during the baking process. That isn’t such a bad thing. Serve it on the hot side of warm because, you know, the oozing of the cheese (aka the cheeoozing). Heat up a good pizza sauce for dipping and there will be happy mmm mmm mmm noises emanating from the mouths of your family, friends, or guests. I stepped away for a moment and Jeremy had already devoured three amorphous blobs. When I came back into the kitchen, he mumbled, “These are so good!” as he stuffed the fourth into his pie hole. They really are glorious little nuggety snacks. 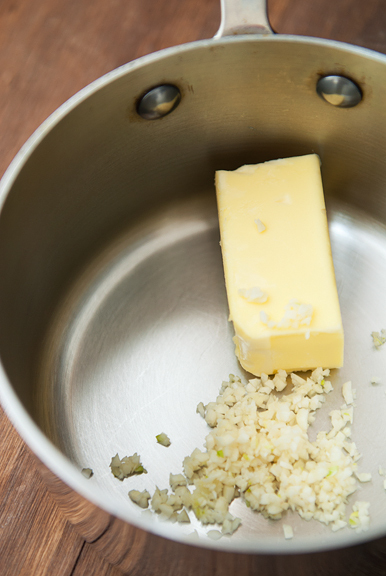 Place the garlic and butter in a small saucepan over medium heat. When the garlic begins to brown, remove the pan from the heat. 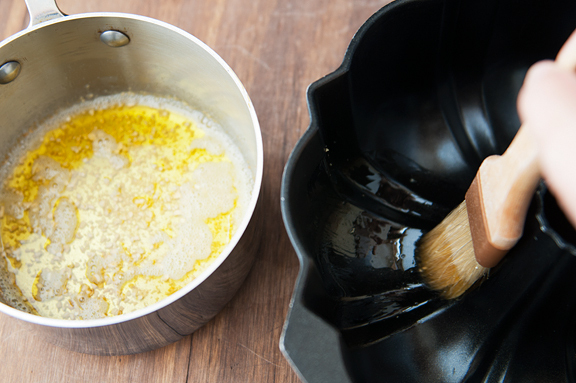 Brush a bundt or tube pan with some of the garlic butter and set aside. Brown the Italian sausage in a sauté pan. 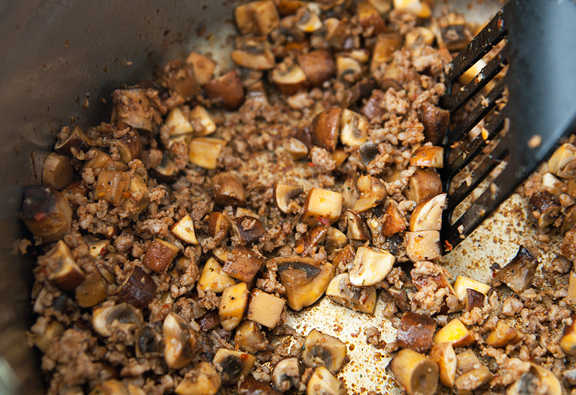 Add the mushrooms and sauté until cooked (if the sausage is lean, then you can add a little vegetable oil to help cook the mushrooms). 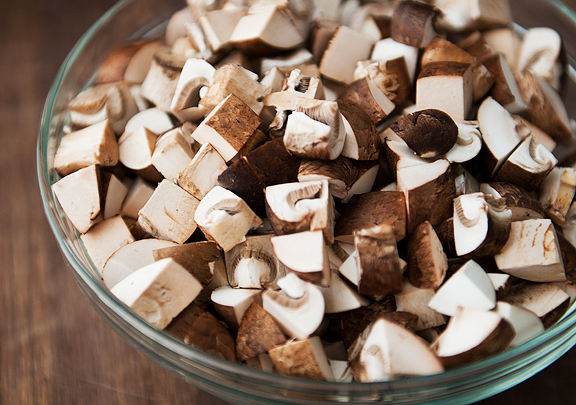 Remove the sausage and mushrooms to a bowl. Heat the vegetable oil in the same sauté pan that you used for the sausage and mushrooms. Add the spinach when the oil is hot. Sprinkle salt to taste over the spinach and sauté until the spinach is wilted. 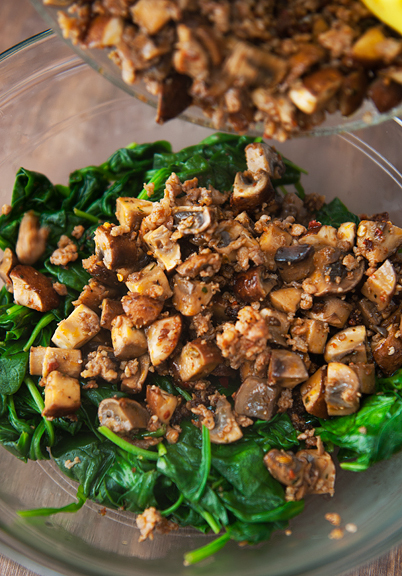 Add the spinach to the sausage and mushrooms and mix together. 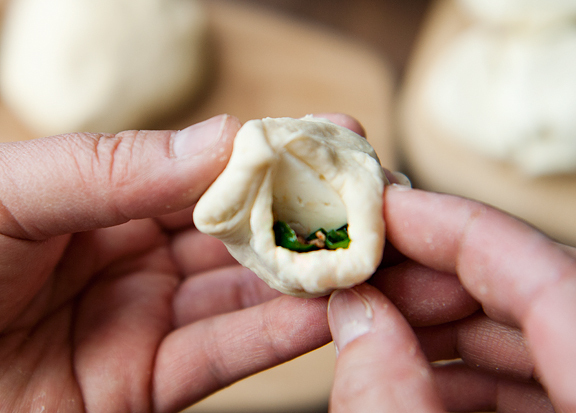 Pinch off 2/3-ounce lobes of pizza dough which should give you 48 balls of dough. You can do this as you go or you can pinch them all off in one go. 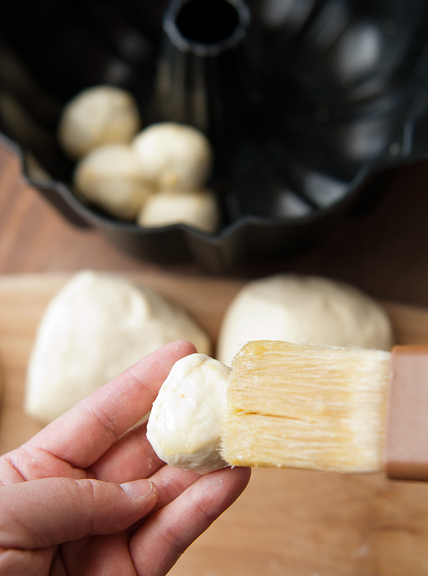 If you do the latter, cover the dough balls with a damp cloth or paper towel to prevent them from drying out. 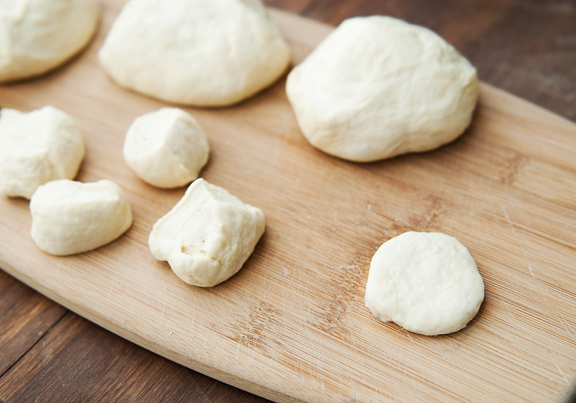 Flatten a dough ball into a 3-inch diameter round. 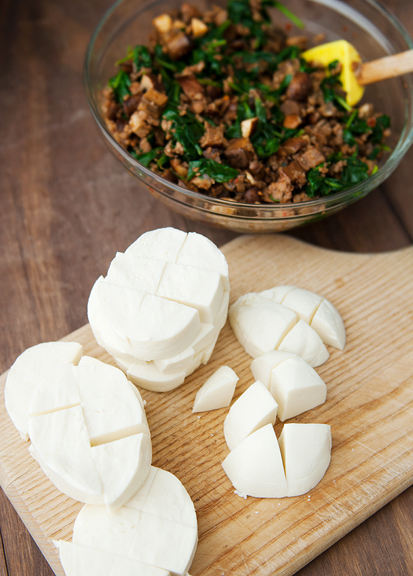 Place a tablespoon of filling and a piece of the mozzarella in the center of the dough (or less if it won’t all fit). 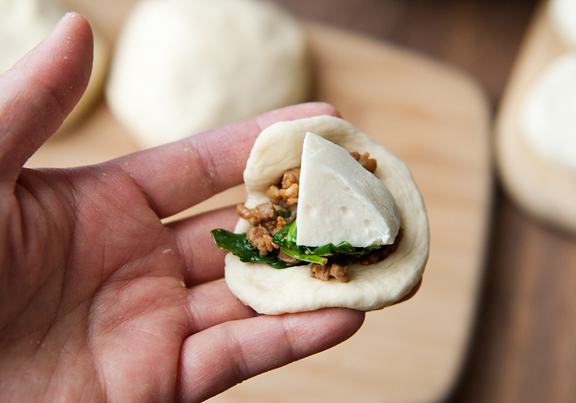 Wrap the dough around the filling, pinching the ends together to seal the ball. Brush the ball with the garlic butter and place it in the bundt pan. Repeat for all of the balls of dough, distributing the balls evenly in the pan. Cover the pan and let rise for 30 minutes. Preheat the oven to 400°F about 10 minutes before the rise is done. Bake for 35 minutes. Remove the pan from the oven and let sit for 10 minutes. Invert the monkey bread onto a plate. 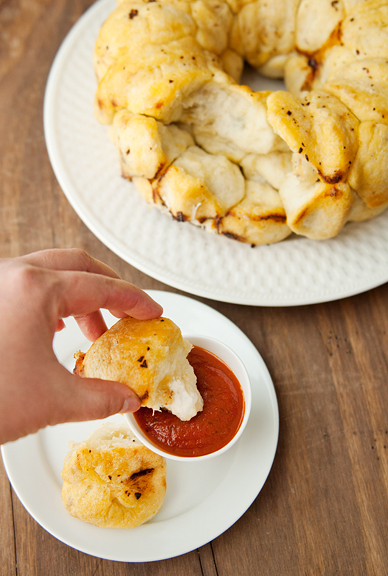 Serve with heated pizza sauce for dipping. Makes 48 delectable pizza balls. Dude. Whoa. That’s all I can say about the awesome snow we’ve been getting and this monkey bread. Looks sinfully fantastic! I never even heard of monkey bread until now! Wow what a delicious looking little thing that is! But lots of work…I really wish someone could just make it for me :) Yours is perfect but no wonder, you are really the perfectionist! I knew I shouldn’t have read this post at 10.45am – now I want to run out of work and go cook monkey bread! This looks so good. Oh wow! I wasn’t at all interested by the title of the post, but now….YUM! Yum! This looks amazing! I can’t wait to try it! Savory monkey bread? Pure awesomeness. Winter is hanging on, isn’t it? I’m not really complaining, but it’s definitely been an interesting year. 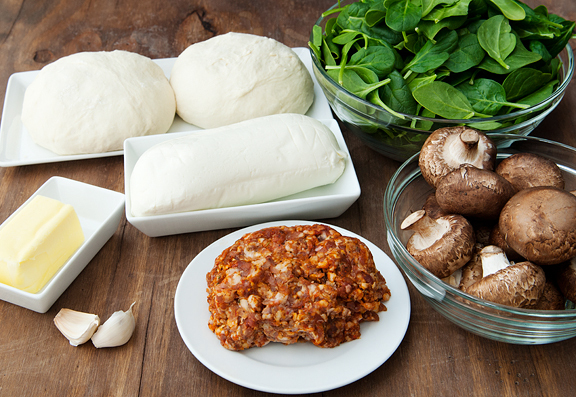 I don’t know if you know this, but sausage + spinach + dough is one of my ultimate trifectas. BLISS. Agree with you on the Pinterest Food & Drink section. I think the type of food on there is actually sort of interesting, it seems like they are either Weight Watchers/ton of processed ingredients/low fat or on the other side of the spectrum, something totally over the top. I try to stick to the middle the best I can. This interpretation of the monkey bread looks fantastic! Something I will try soon. Oh my gosh. This looks crazy delicious. That filling sounds completely fabulous! YUM, what a great dish to have in the oven after a night of drinking w/friends, soaks up everything! Love it Jen! Yum, Yum, Yum!!!! I wish I lived around the corner from you and could hover outside for some leftovers! 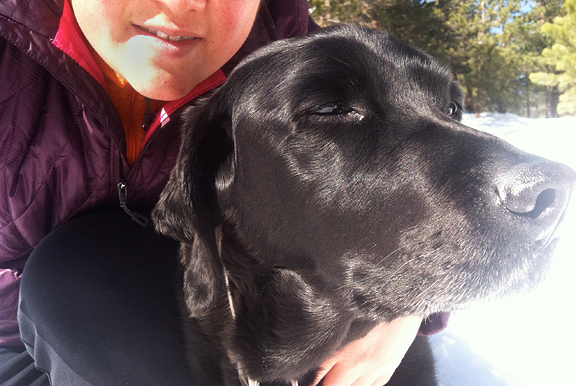 :) I’m enjoying the snow we’ve had, too. I love it when the sun comes out and it’s sunny and snowy at the same time. This literally made my mouth water! I agree with a majority of the Pinterest recipes (how lazy – and unhealthy – has society become?) but once in awhile a good one comes along. This recipe is Awesome! I see this tasty recipe and a million more tasty variations come to mind. Thanks for the Monkey Inspiration! oh my, this looks awesome. 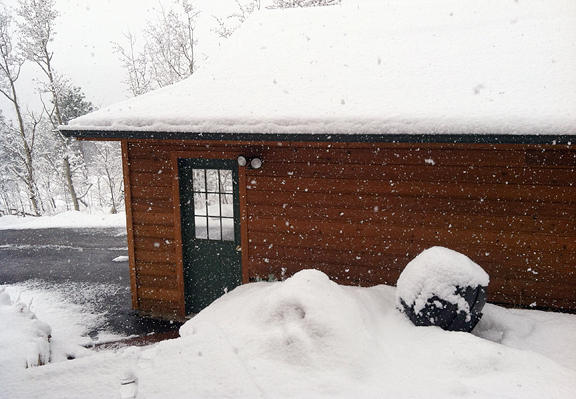 I think that we may be finally done with snow. 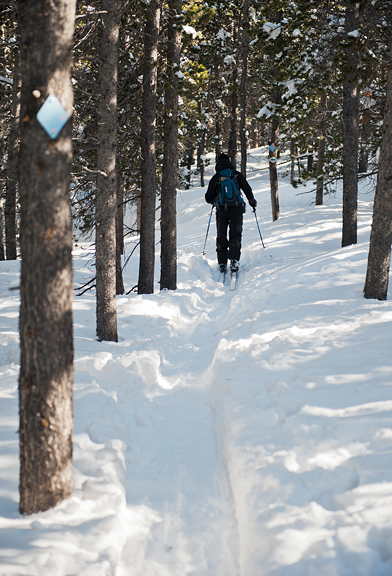 We still have some hanging around, but the temps are creeping up and we probably won’t have any new snow. Who knows though? We’ve had snow as late as June so I can’t really say!!! Oh my, yes yes yes. This looks so incredible. 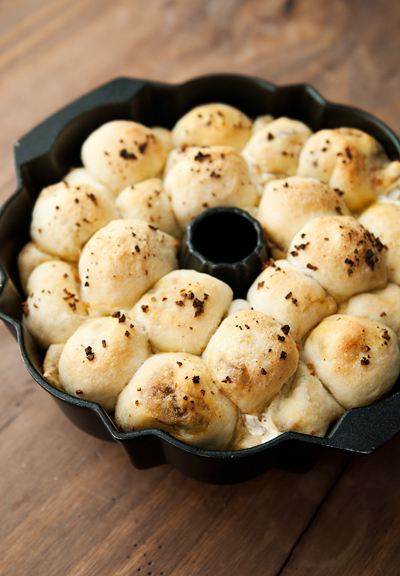 Brilliant idea to make a savory monkey bread. I would give anything to be able to reach into my computer screen and pull off a piece right now! And I share your dismay for the plethora of scary recipes on pinterest! This took quite a while to assemble, but it was really yummy! Thanks for sharing. When my 2 year old saw it come out of the pan, he said, “Wow!” He had already had his dinner (due to this taking a little bit longer than I had anticipated), but he quickly devoured 3 of the balls. This made quite a bit of food, so hopefully the leftovers come out as nicely. Great twist on the monkey bread idea! I have only seen sweet monkey bread recipe’s before, but I think I like (love) this one more. It sounds perfect for family get togethers. Wow, that looks good. I am dismayed as well on the scary recipes on Pinterest. I find I do better when I search out a specific ingredient, and go from there. 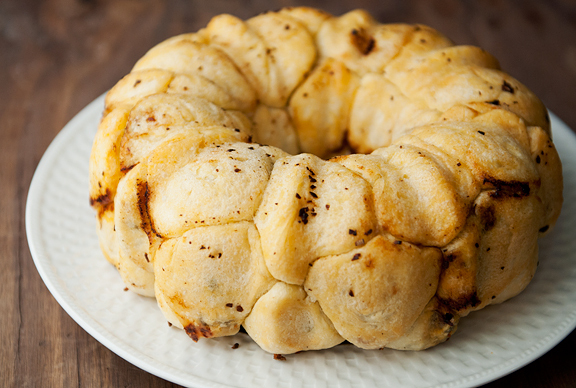 Sherry – I think the first time I saw savory monkey bread I had similar thoughts. Caroline – you can always opt for pre-made dough and it’s a lot less work if you use let’s say, pepperoni slices instead! Zenee – so good (be sure to share or else bad things might happen). Kimberly - yeah, I find it sad and telling about what the majority of folks are eating. Cindi - yes, it's true. I think the art of pinterest is the art of being able to filter out the junk! Alanna - I love how each little nubbin is something you could share with a friend. Stephanie - wow, what a good eater! The leftovers are fantastic if you warm them in an oven. So glad the little guy enjoyed them. Bernadette - I actually saw the savory versions first and then started to see sweet versions when I began to take notice of "monkey bread". Noms! MaryW - yes, good point. Is it possible to prepare this in the morning, refrigerate during the day, then bake at night? Betsy T – I think as long as you give it time to come to room temperature and do the rise time, it should be okay (but I’m not sure because I’ve never tried that).